Career and love will enjoy the limelight..or education and academics would steal the show? 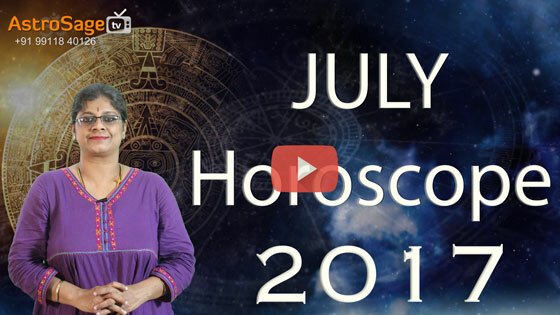 Get all your queries answered and resolved in the predictions for the Monthly Horoscope for July 2017. The month would start on a cordial note, as things would be blissful at home. You will enjoy a financially stable month; family will stay with you through thick and thin. You are advised to stay fit by meditating and exercising regularly. Read more..
With a increased income, you’ll enjoy a blissful life, but that aim of always getting everything won’t subside. Children might have a problematic education in this duration. Despite your anger, partner would be supportive and aid you in solving your temperamental issues. Read more.. Worried about your child’s education? Get his/ her Education Report TODAY! A promotion is on the cards for you this month! There will be a steep rise in your energy levels, making you excited about things pretty quick. However, this month might prove to be a challenging time for your love life. Read more.. The month would garner you respect and honour from all the corners. You’ll bask in the glory of all your achievements. Chances of you considering a job change are high. You are advised to avoid junk and oily food at all costs. Read more.. The month presages a decline in the health of the children. You will have to pay heed to what they eat and when. Any auspicious event might take place at your home this month. You are advised to stay super sweet towards your love partner in order to have a perfect and comforting relationship. Read more..
As the month progresses, you’ll witness a loving and cordial environment at home. You’ll meet new friends and rekindle with the old ones by the mid of the month. Due to your hard work, you'll get appreciation and praise at work. Read more.. This month you could expect a salary hike coming your way! Chances are that you might plan a long trip with kith and kin. You are advised to take care of mother, as she might befall sick in this duration. Read more.. The month predicts that your expenses might skyrocket in this period. However, a promotion at work would aid you in dealing with it. You’ll get inclined towards spirituality and religious activities. Throughout the month, father will be the pillar of strength holding you together. Read more..
A trouble in paradise is presaged for some natives. You’ll have bickerings and confrontations that would have the potential of turning hot any moment. At work, you’ll garner fame and glory due to your past efforts. A long trip with family looks attainable in this month. Read more..
Get all the answers to your marriage related woes with a Detailed Marriage and Children Horoscope Report . This time period would be the perfect one for those who’ve been planning to get married. Mother’s health would require your attention; drive carefully and avoid driving rash. Some benefits might ring in from your spouse. Read more..
You might have a bitter romantic life in this month, but that doesn't mean that your partner would love you any less. You’ll shell out more than what you usually do and this would increase your expenses manifold. Some minor problems at home will keep you stressed. Read more.. The month would give you lucrative benefits. Singles in this duration stand a chance to get married. You can consider buying a car or a property in this duration. Life partner would support you through thick and thin. Read more..